Some replacement parts arrived today. Thanks LMC Truck! And kudos for your customer service. In the meanwhile, I been tinkering a bit more. The fan shroud is now properly aligned. The lower hood latch is installed. A leak at the radiator’s Low Coolant warning sensor outlet was resolved with some thread sealing tape. New coil springs on the rear are installed – with new shocks designed for the 6″ drop. A pesky situation was resolved with the emergency brake cables (mainly, they had been hacked in two and tied to the frame with bailing wire). So, new brake cables are now replaced on both sides. New wheel studs replace the shorter ones on all four wheels. The short studs did not play well with the new alloy wheels – only providing a quarter inch per lug of thread length. 1/4″ of thread inside each lug nut – times 6 lug nuts per wheel meant that there was only 1-1/2″ of 7/16″ bolt area holding each wheel on. Not good. Adding the extra half inch (times six lugs per wheel) increased the total thread length from 1-1/2″ to 4-1/2″ per wheel. Now there are as many threads on the studs as there are in the lug nuts. Much better! 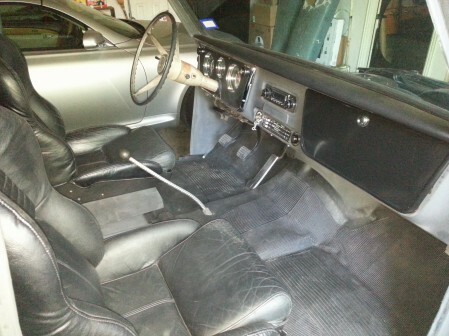 Except for the steering column, steering wheel, visors and door panels, the interior is almost done. New dash pad, instrument panel, radio, AC/Heat controls, light switch, dome light and dome light wiring, wiper switch, cigarette lighter, ignition switch – and ignition cylinder keyed with the old style hexagonal keys. all knobs and bezels, pedal pads, glove box liner, glove box door, floor mat, and a pair of bucket seats from a 1995 Corvette! I fabricated some stationary seat rails for the time being while I check into the possibility of replacing these with 6-way power adjustable seat rails. I also put a new metallic coating on the funky re-bar shifter and added a set screw though the shifter ball which previously had an annoying tendency to come off in your hand when shifting gears. Steering column doesn’t match so well anymore, does it? In the background of this picture is the paint color I’m considering: Lexus Millennium Silver would be kinda purty. Also in the background (on the right side) are the ‘Before’ bench seats leaning against the wall. Not pictures are the new retractable seat belts I installed after the picture was taken. On the back wall of the cab, over and under the window are four mysterious mounting holes. 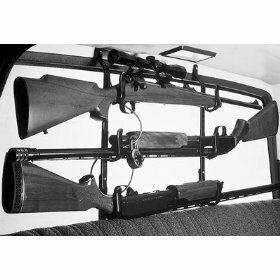 Could it be that the ’68 Chevy truck once sported an ‘Easy Rider Rifle Rack’? A replacement for that might be an interesting find! 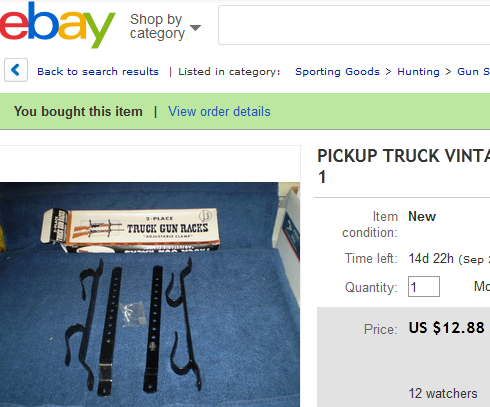 That’ll look good with a pair of Thompsons.